To ensure quality, completed products are viewed and measured via automated inspection equipment, with magnification levels up to 350x. Summary documents are available upon request. Customers are able to customize their inspection and sampling plan. 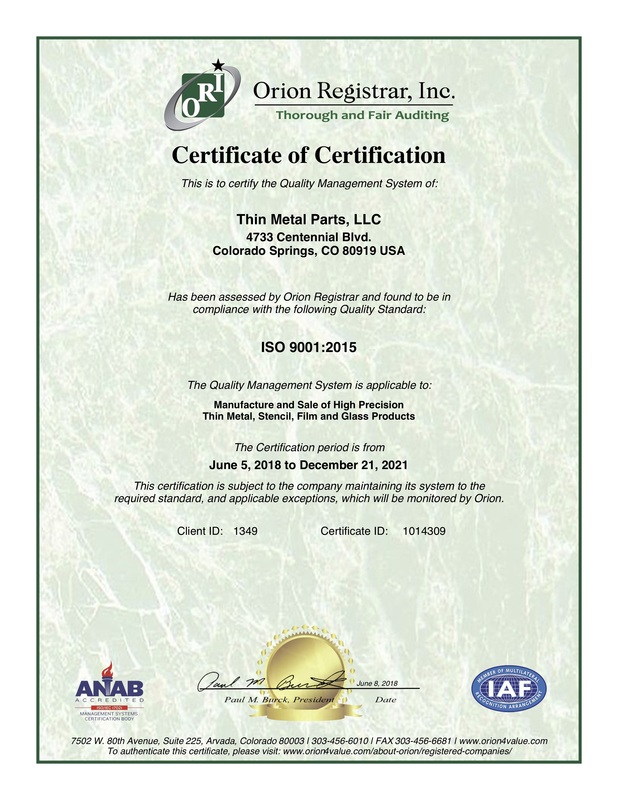 Thin Metal Parts is a certified manufacturer of parts under ISO 9001:2015, certificate #1014309, and was one of the first parts manufacturers to become ISO 9001 certified in 1997.
enhance customer satisfaction through the effective application of the system, including processes for continual improvement of the system and the assurance of conformity to customer and applicable statutory and regulatory requirements. Annually, Thin Metal Parts is evaluated by a third party which conducts an ISO audit. ITAR Registration is a requirement for manufacturers in the ammunition industry, and is done through the Directorate of Defense Trade Controls (DDTC). This is an important registration for customers that will use parts in products for this industry. Using three different technologies, custom metal parts can be built for a large variety of industries. By combining multiple technology options together, a precision part, unavailable anywhere else in the marketplace, can be custom manufactured. Thin Metal Parts regularly works with aerospace, computer, and electronic industries to build custom precision parts used in industrial and consumer good applications... parts such as metal encoder wheels, metal mesh, and print heads. In addition, custom parts are developed daily in research and development as the design/process engineer group teams with customers to develop prototypes and production items in medical, manufacturing, and scientific instrument sectors. All of Thin Metal Parts' products are custom manufactured to meet customer needs and specifications, including DFARS and RoHS compliance. These quick-turn, cost-effective, low tooling cost processes offer excellent production alternatives to traditional fabrication methods for metal parts in high volumes and prototyping.